If you’ve ever looked into a kaleidoscope, you’ve experienced the beauty created when a small design mirrors itself into an amazing burst of color and movement. You can now recreate these magical images with these patterns. Each of the 11 full-size patterns is about 24” in diameter and will fill your window with a bright splash of radiant colors. These versatile designs can be created with any color scheme and be easily adapted or resize to fit whatever space you want to bring to life. 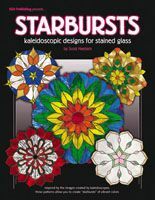 Includes: 11 Patterns for 24" diameter kaleidoscope images.